This fabulously spotted breed is beautiful both inside and out. Even tempered, intelligent and very pliable, the Egyptian Mau is a true jewel among cats. As humans evolved and began to grow crops these cats evolved to exploit the vermin that plagued our store houses. 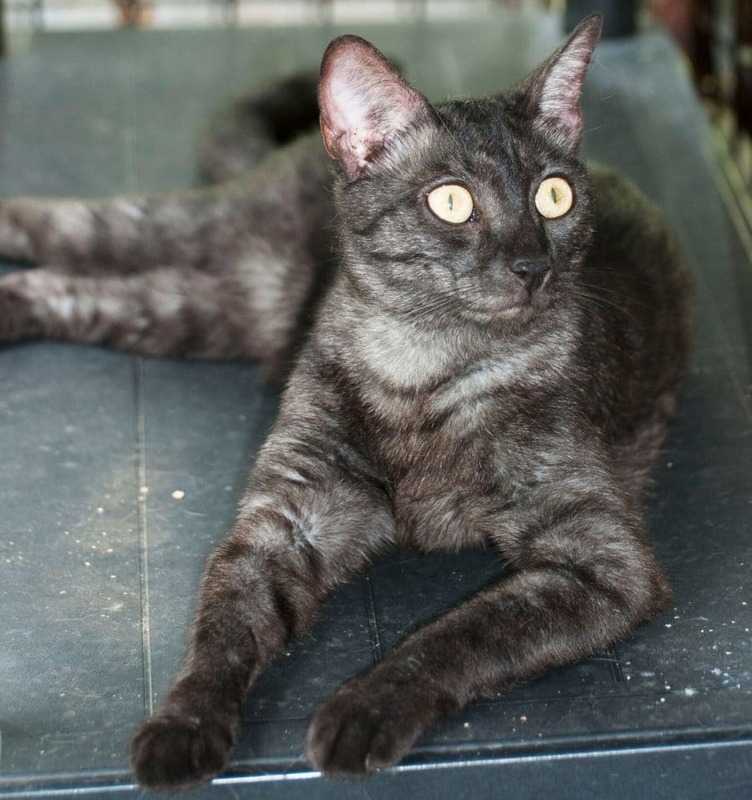 Self hybridized over thousands of years from various wild African cats only the most social and pliable cats formed the foundation of what we now call Egyptian Mau. These are the cats found in the tombs of the Pharaohs and worshiped as companions and for protection of food stores. There are the very beginnings of all “Domestic” cats. A recent study of the domestic cat’s genome has shown that all current domestic cats have their foundation in the street cats of the Middle East and Fertile Crescent, the very same place early man evolved. Almost lost to history, this breed was resurrected in the 1950s from a silver female brought to the US from Europe and then bolstered by additional imports. The street cat of Egypt, their genetic finger print is found in all current domestic cat breeds. 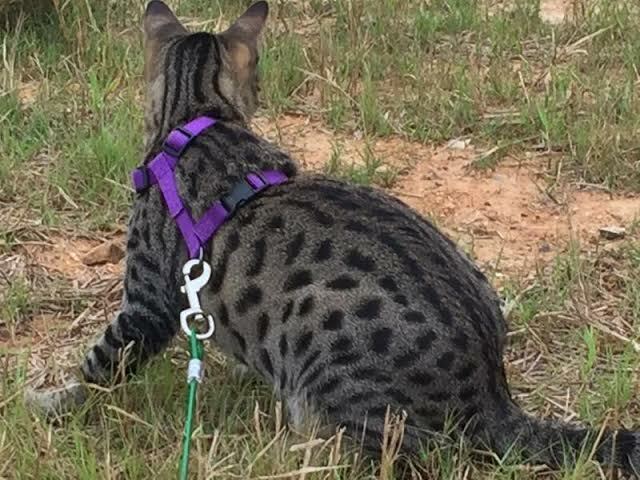 Being the only naturally spotted breed, commonly available, it is a foundation cat for most other selectively bred or hybridized spotted breeds. Maus not only add their great spots but their stable, dependable, disposition to the breeds it has help to improve. Stable disposition is a hallmark of the breed. Although each cat has their own personality, as a breed all are born and bred to be pliable amiable companions. They are adaptable, as one would expect, after thousands of years of evolution making them very opportunistic and able to find a niche and thrive in any situation or environment they find themselves in. These personality breed traits are past to many of the spotted breeds they have been used to help found. I like to say you could drop a Mau in the ocean and he would make friends with the fish. A fairly rare breed in the US and Europe they are highly sought after as pets by those who have had contact with them. Extremely intelligent and renowned for their loyal, dog-like personality these cats are loving, social and very trainable. High energy they are not the couch potato many expect in a cat. They meet their owners at the door when they return home, follow them from room to room and stand by closely to give and receive human companionship. So easily trained these cats love to play fetch, walk on leash and are favorites in advertising and movies. As a breed they came into the movie spot light as the companion to “Catwoman’ in the movie by the same name in 2004 with Halle Berry. Popularity of the breed boomed after that and made devoted followers of those who acquire these exceptional cats. Egyptian Maus come to 5 recognized colors. 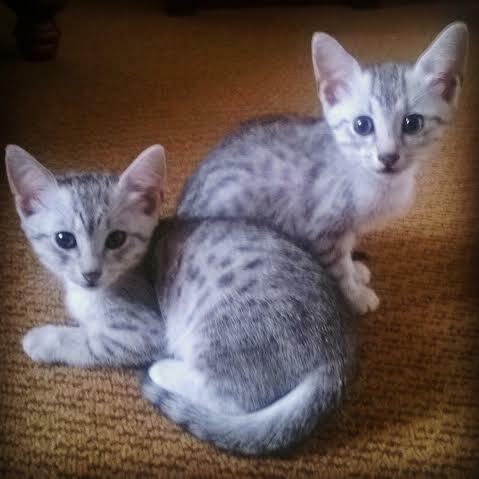 Silver spotted, Bronze Spotted, Smoke spotted, Black and Pewter, only the Silver, bronze and smoke cats are eligible for show but all can be registered. The breed is recognized and a genetic registry is maintained by both CFA (The Cat Fancier’s Association) and TICA (The International Cat Association” along with various lesser known breed registries. All have characteristic “Goose-Berry” green eyes, a melodic voice and an upright forward turning tail resembling a tea pot handle when the cat is happy. They can have a variety of vocalization from melodic meows to chuffs and chirps. Egyptian Maus are the fastest of all domestic cat breeds. They have an exaggerated flap of skin between their belly and back legs allowing them to have an extremely long stride while running. They are athletic and can jump easily from the floor to almost any counter or cabinet top. They enjoy perching above their domain to watch for the next opportunity for play or exploration. Because this breed is a creation of human free evolution prior to the 1950’s they have very few health issues. Like all cats they can have various conditions but they have an overall strong immune system and suffer a lower percentage of genetic issues. They are selectively bred by responsible breeders for health and personality, not color since they are naturally spotted. Being a “Street Cat” they can survive on a very poor diet and if owners are not careful they can become overweight. Over weight maus are prone toward, bad joints, fatty liver and diabetes so keeping your mau fit is very important. 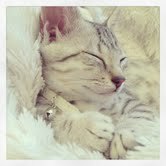 A true companion animal, beloved for thousands of years, you can’t go wrong with an Egyptian Mau.